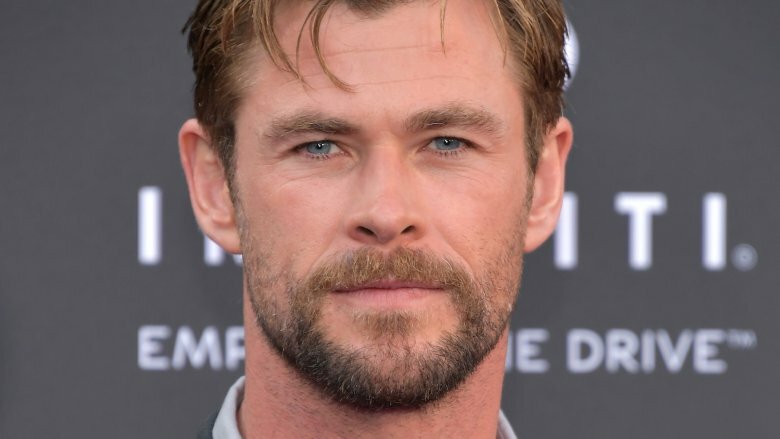 Chris Hemsworth is officially a man in black. The first set photos from the Men in Black spinoff film have surfaced online. Uploaded to Just Jared, the snaps show Hemsworth, who leads the pic alongside his Thor: Ragnarok co-star Tessa Thompson, sporting exactly what one would expect him to in the forthcoming franchise installment: a crisp white shirt, black slacks, a simple black tie, and sunglasses that perfectly pull the ensemble together and are basically required for all main Men in Black series stars. While these pictures mark the first peek at Hemsworth's Men in Black character and they do show fans what the beefcake actor will look like in the upcoming film, they don't do a whole lot to reveal specific details about the man he plays. What's his name? What's his deal? How good is he at supervising aliens? And are we even allowed to ask this many questions, or will we get a swift neuralyzer to the face after a certain number of inquiries? We don't have the answers to those questions at this time, but we do know a few things about the film that can help inform our understanding of Hemsworth's character. It's a known fact that the spinoff takes place in the same universe that the original Men in Black trilogy did, and that the film will be "more global in scope," reportedly set in London. Additionally, original franchise stars Will Smith and Tommy Lee Jones are quite literally out of the picture — their characters, James Darrell Edwards III/Agent J and Kevin Brown/Agent K, aren't involved at all. Bearing those tidbits in mind and pairing them with these first-look photos, one can string together an idea about what type of guy Hemsworth might portray in the new Men in Black. He's likely the modern answer to either Smith's Agent J or Jones' Agent K, he may or may not have an English accent if the film really is set in London (Hemsworth's an Aussie with a knack for imitating Brits, making this point even more plausible), and he probably has a very important, alien-overseeing job to do based on the all-work, no-play threads he rocks. The Men in Black spinoff, directed by The Fate of the Furious helmer F. Gary Gray and written by Iron Man scribes Art Marcum and Matt Holloway, is due out on June 14, 2019 — leaving us with just under a year to mull over (and hopefully learn more about) Hemsworth's role.